As far as scuba diving is concerned, hitting the water should be like turning on a light in your brain, it's time to focus. This is the point where many problems start for novice and experienced divers alike. If you have read the section 'Before the Dive' you will be OK at this point, if not, expect problems, maybe not from you but certainly someone in your dive party. I have witnessed many things at this point but don't think I have seen it all because I have not. Prime examples are forgotten weights, insecure equipment loss, insecure cylinders and my favourite was on a 70m drysuit dive some years ago. Two buddies spent half the morning bragging about their experience, first one in realised he had not connected his drysuit inflate hose, then realised he had the wrong set of regs with no hose, end of dive for him. His buddy, still laughing at his friends stupidity stepped off only to find he had forgotten to zip up his drysuit, two divers down and we haven't started. Sometimes we forget how it feels on entering the water but for others it's alien to them, especially new divers who's experience consists of confined water and shore dives. Remember that hitting the water is not the start of a race to the bottom, it's the start of an hours pleasure for you and your buddies. First and foremost signal OK to the Boat Crew, Dive Master (DM), Buddy, in fact anyone who is taking notice, this tells me that - a, you are OK and b, that you have your thinking cap on. Quickly move away from the entry point to allow your buddies to enter, take a moment to asses your own situation, are you buoyant, is all your gear in place and secure ? Relax and watch the other divers enter, mentally check their gear, is everything OK, do they have a weight belt/weights, is their regulator in place and not their snorkel ? Do not be afraid to shout STOP if you see something is wrong !! OK, so you have been in the water a minute or so, the cool water has entered your suit, everything is OK. The last diver has stepped off the boat so time to descend - WRONG !! It's time to let that last diver acclimatise as you have done, that last diver may have had a problem, has been rushing around trying to gear up, is out of breath and may need to relax. Personally I prefer to mix water entries starting with a DM/Advanced Diver - Novice/Inexperienced/ - Me/DM/Advanced/Experienced. By mixing you have a chance to avoid problems, the first diver can see the next one enter and check OK, if there is a problem you have a DM to assist. I like to be last as I can check all divers in and no one descends without me, so this gives all divers time to relax and get ready to descend. When group diving like this it works fine, but sometimes there are other people who are not part of your group who just want to do their own thing, that's fine but it must be clear before you step off the boat. S = Signals. Signal that you are OK and ready to descend. O = Orientation. Orientate yourself as to where the boat/land/shot line is and also where your buddies are. R = Regulator. Put your regulator in. T = Time. Check the time, you will need this to complete your dive log. Final signal OK, if all OK on the final OK, signal descend and start your descent. ED = Equalise/Descend: Remember to equalise on descent. Here is where it happens, between the surface and 5m down, this is the time that all of you should not only be thinking of yourself and your own situation, you should be also watching your buddies. Normal problem is failure/inability to equalise and or establish buoyancy control. Remember it is not a race to the bottom, deflate your BC slowly and get into the habit of equalising your ears long before it hurts, remember that the higher the pressure the harder it is to equalise. Let me try to give you an easy explanation to help you understand the principle of equalising your ears: Imagine I have a box of 1 kg weights and I am going to put them on your foot one at a time, you can take them off at any time but you can only take them all off, not just one at a time. With the first 1 kg you feel nothing, then the second, third and so-on, by the time I have got to 40 kg your foot is hurting but now you have to lift off the whole 40 kg, by this time your foot is sore but you don't have the strength to take off the whole 40 kg, so you ask me to take them off one at a time. This is the same principle as ascending to relieve the discomfort caused by the pressure in your ears but would it not have been better for you to take off the weights before it hurt and before they were too heavy for you to lift ? So now we are all at 5m and all set to go, buddy pairs have been established before the dive, everyone is settled and relaxed, now enjoy your dive. Remember, Plan Your Dive, Dive Your Plan .. Yeah right !! You may have this in your head but the marine life don't. You are at the agreed 20m max when below you Tommy Turtle is pootling about minding their own business and off you go. 20 m, 21, 22, 23, 24 ... 30 m and you still haven't caught up with him. STOP !! That's far enough, time to ascend to your planned depth and leave the turtle to another day. 1, You are below your agreed depth and 2, you have consumed more air because of the chase and increased depth. People dive for different reasons, personally I like the peace and tranquility and after so many years diving, I have seen more marine life than I care to mention, others take photographs, others just like to look but no matter what your reasons are, spare a moment for your buddy AND other divers around you. Be considerate, there is nothing I hate more than a face full of fin or to see divers disrespecting our undersea world. The rule is simple, break nothing, touch nothing, walk on nothing, be alert not only for yourself but other divers, never be afraid to act should you feel there is something wrong and above all .. Take nothing but photographs, leave nothing but bubbles ! For the recreational diver there is very little to see below 30 m so don't bother going there, it's dark and cold but for others .. Oh Yes !! I love the statement "you can't go below 40 m unless you are trained" .. Yes you can, very easy .. all the way to the bottom if you wish. The statement should be " you won't come back from below 40 m if you are not trained". Wall dives take some thought on behalf of the diver and their dive buddies, buoyancy control is critical as it takes seconds to drop off to oblivion if you are not concentrating. By now you should have your BCD under strict control and be quite happy at neutral buoyancy, if not you should not go over the wall, keep to the top edge and follow your buddies around the wall, they will come up soon enough. Normally if I am leading a wall dive I position myself or my DM on the outside a couple of meters lower than the group, this gives me/them a chance to intervene should a diver start descending, it also gives them a physical and mental barrier as they understand they do not pass that point. The group is quite well spread out. Watch the blond girl at 54 seconds, she is checking her gauge and finning hard to stop herself descending when all she needed was a little air in her BCD. I have the deepest respect for this diver and only contempt for the dive master who was almost responsible for the deaths of two young divers. This video is frightening but happens all to often. This his video highlights one of the points I wish to make regarding not only safe diving but being alert. Had it not been for this diver, they would be looking for two bodies and one of them is only 12 years old. The diver who rescued these two should be given a medal, the dive master who left them should be charge with reckless endangerment at the very least. The diver is at 72' (22m) when he sees the two acting strange, he descends to 100' (30.5m) then 111' (34m), 129' (39m, 40m is the maximum for recreational diving allowed by any discipline) They were below 150' (over 45m) one had 700 psi (48 bar) of air, the other only 400 psi (27.5 bar) at that depth they have less than 3 minutes of air. They made a controlled ascent to 15' (4.5m) at which point one of them was out of air. 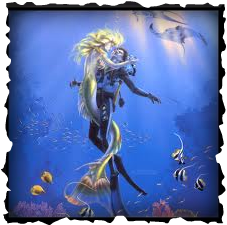 Rapture of the Deep, also known as l’ivresse des grandes profondeurs and The Martini Effect, call it what you will, it's true name is Nitrogen Narcosis. Nitrogen Narcosis is a reversible alteration in consciousness that occurs while diving at depth. (Not to be confused with DCS 'the Bends', we will cover that later.) Narcosis produces a state similar to alcohol intoxication and can occur during shallow dives, but usually does not become noticeable until greater depths, beyond 30 meters (100 ft). As depth increases, the mental impairment may become hazardous. Although divers can learn to cope with some of these effects, it is not possible to develop a tolerance. While narcosis affects all divers, predicting the depth at which narcosis will affect a diver is difficult, as susceptibility varies widely from dive to dive, and between individuals. When narcosis appears, it may be completely reversed in a few minutes by ascending to a shallower depth with no long-term effects. For this reason, narcosis while diving in open water rarely develops into a serious problem as long as the divers are aware of its symptoms, and may ascend to manage it. Diving beyond 40 m (130 ft) is generally considered outside the scope of recreational diving: as narcosis and oxygen toxicity become critical factors. Due to its perception-altering effects, the onset of narcosis may be hard to recognize. In its most mild form, narcosis results in relief of anxiety - a feeling of tranquility and mastery of the environment. These effects resemble the effects of alcohol and are not harmful unless they cause some immediate danger or are not recognised and addressed. Once stabilised, the effects generally remain the same at a given depth, only worsening if the diver ventures deeper. The most dangerous aspects of narcosis are the loss of decision-making ability and focus, and impaired judgement, multi-tasking and coordination. Other effects include vertigo, and visual or auditory disturbances. Narcosis may cause exhilaration, giddiness, extreme anxiety, depression, or paranoia, depending on the individual diver and the diver's medical or personal history. 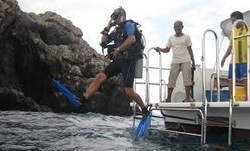 When more serious, the diver may feel overconfident, disregarding normal safe diving practices. The relation of depth to narcosis is sometimes informally known as "Martini's law". This is the idea that narcosis results in the feeling of one Martini for every 10m below 20m depth. This is a very rough guide, and not a substitute for an individual diver's known susceptibility, or for standard diving safety guides. Professional divers use such a calculation only as a rough guide to give new divers a metaphor, comparing a situation they may be more familiar with. Mild impairment of performance of unpracticed tasks. Delayed response to visual and auditory stimuli. Reasoning and immediate memory affected more than motor coordination. Calculation errors and wrong choices. Over-confidence and sense of well-being. Anxiety (common in cold murky water). Severe delay in response to signals, instructions and other stimuli. Decrease in dexterity and judgment. Increased intensity of vision and hearing. Take a close look at the list above and take the time to remember some of the signs and symptoms. Remember that many of the signs and symptoms are such things as errors in judgement, happiness, impaired judgement. Learn to recognise these symptoms in yourself and other divers or you could enjoy uncontrolled laughter until death. So all is well and you and your buddy have enjoyed a great dive, now is time to head back to the boat for lunch, a nice relaxing surface interval then dive two. By this time most of your party will be somewhere under the boat or will have surfaced, as descent is not a race to the bottom, ascent is not a race to the top. Make your way back to the location of the boat, or where you think it is, if all is well you will start to see others from your party swimming around, just using air and enjoying a nice deco stop. Deco Stop, Safety Stop, Pause in Ascent. Call it what you will, Deco stop is normally associated with deep dives where as Safety Stops are associated with Recreational Diving. While a safety stop is in essence a kind of ‘decompression stop’, if the diver has remained within the NDL (no-decompression Limits) throughout the dive, the safety stop is more of a precautionary measure rather than a mandatory stop unlike a decompression dive stop. Most recreational diving discourages divers from intentionally doing decompression dives (i.e. dives beyond the NDLs of dive tables) this is because on a single tank dive, the chances of a diver running out of air while having to perform long decompression stops is highly likely, putting the diver at risk of either running out of air, or skipping the deco stop and possibly ending up with DCS. Every diver has been told to perform safety stops, yet many divers never do, this is particularly true of today's recreational divers. Why? Probably because they don't understand. Many divers have been informed that performing a safety stop allows them to slowly eliminate nitrogen from the blood. This is simply not true. A safety stop assists the body in quickly eliminating nitrogen! Nitrogen bubbling does not occur in a diver under pressure, it only occurs when the pressure is reduced "too much". Once Once Nitrogen bubbling occurs, gas elimination is reduced. This is because the driving force for nitrogen elimination has diminished. The bubble now has to be reabsorbed - which can be a time consuming process. However, if bubbling can be minimized or prevented, then the nitrogen stays in a gaseous solution (i.e. dissolved) in the body. If this can be maintained while surfacing, then the nitrogen pressure is maintained while the pressure surrounding the diver is reduced. When the nitrogen pressure is allowed to stay greater than the surrounding pressure, a driving force for nitrogen elimination is created and nitrogen will leave the body quickly. To put it even simpler, a diver that performs a 3 minute safety stop after a dive will have less nitrogen in their body immediately upon surfacing as compared to a diver that did not perform a safety stop, but has been on the surface "off-gassing" for 3 minutes. Therefore, one of the best things a diver can do for themselves is to perform a safety stop, no matter how short, after every dive.